“It is very encouraging to hear the Prime Minister himself is taking an interest in the chronic levels of traffic and congestion drivers face in the years ahead. The roads are a vital asset and need adequate investment. Almost everything we do requires travel and if there is not the money to adequately maintain the network the country will grind to a halt. “In the early months of the Coalition, the Deputy Prime Minister and I set out the two great purposes of this Government. First, we want to bring about a Power Shift, putting more power in people’s hands. That is an aim we’re fulfilling through public service reform – as in schools, where parents are getting more control than ever before over their children’s education. We are achieving it through decentralisation – as in the Localism Act, whose provisions enabling local communities to take over the running of local services and decide their neighbourhood plan come into effect in the next few weeks. And we’re achieving it through political reform – as with the new Police and Crime Commissioners who will be elected in November, and the new executive mayors in our great cities, following what I hope will be the positive referendums in May. But the second great purpose of this Government is to engineer a Horizon Shift – to prepare Britain for long-term success – and that’s what I want to talk about today. Of course the most immediate example of our long-term thinking is our commitment to deal with the disastrous legacy of debt and deficit that we inherited. The tough and responsible decisions we’re taking on tax and spending are the essential starting point for long-term economic success. But they are the starting point, not the end point. Yes, we should avoid leaving liabilities for the future. But as well as that, we should be leaving assets to sustain future prosperity because good government is about building for tomorrow. More than anything, that means infrastructure. Today, as we approach the Budget, I want to set out a vision for this county’s infrastructure in the 21st century. How we can pay for it. And some specific steps that we’re going to take. But first I just want to explain why infrastructure matters so much, and what’s gone wrong with the way we provide it in Britain. Because the truth is, we are falling behind. And falling behind the great, world-beating, pioneering tradition set by those who came before us. There is now an urgent need to repair the decades-long degradation of our national infrastructure and to build for the future with as much confidence and ambition as the Victorians once did. Infrastructure matters because it is the magic ingredient in so much of modern life. It is not secondary to other, more high profile elements of economic strategy. It affects the competitiveness of every business in the country; it is the invisible thread that ties our prosperity together. It gets power to our lights, water to our taps, workers to their jobs, and food to our shops. It enables factories, offices, warehouses, workshops to function, to trade, to grow. But infrastructure isn’t just about business. It’s not just about big, high-profile projects. It is an all-pervasive force in society too. It’s the network that powers smart phones, allows us to log on to Facebook, to travel, to live the lives we choose. It is the platform for active citizenship. And its value lies in its ability to make things possible tomorrow that we cannot even begin to imagine today. If our infrastructure is second-rate, then our country will be too. We used to understand this in Britain. After all, I’m standing here this morning in the Institution of Civil Engineers – the birthplace of so much of the infrastructure we depend upon today. Our national heroes include men of iron and steam like Brunel, Stephenson and Telford – all commemorated in Westminster Abbey alongside former Prime Ministers and great authors like Charles Dickens. Our inheritance includes daring bridges and soaring stations – structures built with Victorian swagger and intended to last like Norman castles. Our national legacy to the world can be seen not just in language and culture, but through the steam engine, the jet engine, the railway and civil nuclear power. And today, too, we are keeping that flame of ingenuity burning. Last year we launched the new Queen Elizabeth Prize for Engineering. This summer the eyes of the world will be on the Olympics – an amazing new city created out of nothing in London’s east in five years. Javelin trains will fly there from St Pancras in just eight minutes – from Europe’s finest station and biggest transport hub to the best games in history. From east London to the west, Crossrail is the largest engineering project in Europe. Our engineering firms like Arup work miracles in steel and glass. Great British architects like Richard Rogers, Norman Foster and Zaha Hadid design airports in China, viaducts in France, and factories in Germany. So let’s not accept the idea that our glories were all in the past that these days we can’t deliver great infrastructure; that it’s not even worth starting because projects always run late or over budget. This morning – as I speak – the fantastic new concourse at King’s Cross station is welcoming its first passengers – more proof that when we set out the vision, find the funding and maintain the drive, Britain can get it right. You only have to travel abroad, and compare it to the experience at home to see that we are seriously exposed as technologies change, demand grows and our competitors outpace us. Yes – some of our infrastructure works well, and I’m not here to run everything down. I accept too that the last government – despite borrowing to spend rather than invest, thereby allowing much of our infrastructure to degrade did make progress on important projects like the completion of High Speed 1 and the new St Pancras Station. But the truth is, no government in living memory has set out a sufficiently comprehensive and ambitious vision of this country’s infrastructure needs. By a comprehensive and ambitious vision, I don’t just mean a list of projects. I mean an overall system – an integrated set of networks that collectively deliver the economic and social goods. But as well as this failure of vision, there’s been a failure of financing. Now everyone knows that infrastructure is expensive. One academic assessment puts the bill at five hundred billion pounds just to meet our current commitments. And we can’t hide from the fact that new infrastructure has to be paid for either by those who use it, or by government, or a combination of the two. We also know that in any political argument about the allocation of resources, the voice of the present can be a lot louder than the voice of the future. But compared to some other aspects of government activity, the up-front investment in infrastructure should be ripe for a non-governmental approach. Investment in infrastructure produces real, tangible assets that can earn a return. And yet no government has really solved the problem of how to finance the infrastructure we need within the public spending constraints we have. Finally, on top of the failures of vision and of financing, there’s been a simple failure of nerve. No government has acted with the necessary determination to blast through the vested interests and bureaucratic hurdles in order to provide what the long-term national interest demands. To put it crudely, we’ve become good in Britain at sweating old assets. But if you do that for too long, there’s a price to pay. It’s not enough just to keep the existing infrastructure going. We need to build – as other countries are building – the completely new infrastructure we need for the future. And on top of all this we haven’t focused – as other countries focus – on ensuring that investment in infrastructure helps business at home. That’s not about picking winners. It’s about helping British companies to be winners. We haven’t done anything like enough to help grow British expertise and jobs in building not only the infrastructure we need here, but in booming markets overseas. Now, after all these years of failure, compromise and lack of ambition, the reckoning is upon us. We lose £7bn a year because of congestion on our roads – and yet the last administration only built around twenty-five miles of new motorway which by the way is fewer than the number of transport ministers in that government. Our railways are crowded and expensive – compared to the French, Dutch and Swiss railways our fares are 30% higher, our running costs 40% higher and our public subsidy is double. You have to admit, it’s something of a miracle to achieve high fares, big subsidies and poor performance – all at the same time. Our average broadband speed is 8 megabits per second – when in South Korea the figure is 31.6. Our planning system for infrastructure is much too expensive and unbelievably slow. It took almost twenty years – twenty years – to get Terminal Five at Heathrow. It will take at least fourteen years for the first section of High Speed Two to open. Compare that to Stephenson’s London to Birmingham railway in 1838. It was the world’s first major inter-city railway, built in just five amazing years from the application to parliament to the first through train. The kind of things we did almost 200 years ago, China does today. Because we’re not just up against old world economies with old world infrastructure. We face new competitors who can leap ahead of us and install completely modern infrastructure from scratch. India has 20 nuclear power stations in service – and 23 more planned or being built. In 2010, Beijing capital airport overtook Heathrow as the world’s second busiest. So we can all see the challenge. The question is how to respond. Consistent with our purpose of preparing Britain for long-term success, this coalition government has been focussed from the start. We’ve worked hard to protect capital spending. We’ve made progress in sorting out planning, getting projects from the drawing board to construction, bringing forward super-fast broadband. And we’re making sure that social and environmental sustainability is not an afterthought. That’s why we’re systematically de-carbonising our energy and transport and creating the Natural Capital Committee, to ensure economic development protects our environment. But the real innovation is in the new framework we’re creating – tackling the three failures that have held back the development of our infrastructure: failure of vision; failure of financing, and failure of nerve. …to a strategic, comprehensive, systematic vision. The starting point is our National Infrastructure Plan – the first time any government has ever drawn together an audit of what we have, what needs to change and what the timescale should be. In transport – better trains and roads. In energy – cleaner, dependable electricity supplies. In telecoms – faster broadband and new mobile technologies. And in construction – a planning system that unlocks sustainable growth, rather than holds it back. It is of course the responsibility of the state to set out an assessment of future infrastructure needs. But we should not look to the state to make all the plans and pay all the bills. If we wait for the state to fund the infrastructure challenge, we’ll be waiting for ever. But equally, it’s wrong to think that this job should fall entirely on the shoulders of the private sector. Getting infrastructure right is a challenge over many decades. It requires private money, but it also requires political support and stability – for the creation of what Adam Smith taught us to see as public goods. So when it comes to the question of financing, we need to use the power of the state to unlock the dynamism of the market. Government has a duty to provide a framework in which demand can be met and which attracts investors – pensions funds and sovereign wealth funds – because they can rely upon fair returns. That in turn means getting regulation right, so that consumers and the taxpayer don’t end up with high bills and too much of the risk. Britain already has a long and successful track record of regulating infrastructure providers, such as the water industry. And now we need to go much further and faster in opening up the financing of our infrastructure. So we are encouraging the appetite of investors – both at home and also abroad – for investment in British infrastructure, taking advantage of our stability and open markets. In a world in which too much investment has been high-risk and short-term, there is huge potential for a different approach. For example, we have established a Green Investment Bank – which will take £3 billion of taxpayers’ money and use it to lever in several multiples of that from the private sector to build our green infrastructure. We are also working with leading British pension funds, so they can invest in solid infrastructure assets as happens elsewhere. And I can announce today that they will make the first wave of £2 billion investment by 2013 – just a small taste of what I hope will follow if we get this right. Over time, I believe investment in good infrastructure can pay for itself. But none of it will happen unless we tackle the third failure of the past – the failure of nerve. So I am determined to show that this Government is serious about building for the future. We will take difficult decisions. We will risk short-term unpopularity. …because our motivation and our duty is to protect and champion the national interest. So let me indicate some of the specific areas where I think we need to act soon, to secure the things our country needs. First, the transport challenge facing us is clear. Demand for rail is higher than at any point since the Second World War. Our key hub airport is full. By 2030 the distance travelled by road and rail in the UK is expected to increase by at least a third. Without world class transport we will not get growth, people won’t invest here and regions in decline will be further left behind. Without better transport, we will continue to pollute, too. In rail, we’re making real progress. Tunnelling began this month – on a project we’ve protected from cuts. Of course it would have been easier to delay – that’s what governments have always done before. But we took the bold decision to make the commitment and unlock the funds. The innovative funding package has the tax payer, the fare payer and the private sector contributing in equal proportions. This will transform east-west links under the capital, a project with immense economic and social dividends for the whole of Britain for decades to come. We’re doing the same with High Speed Two. It’s a project that will transform connections in our country just as motorways did in the 1960s. It’s not only about a quicker line between London and Birmingham – that’s just the first stage – but a national network that connects to Leeds and Manchester with vastly faster, better services. And later this year, we will be setting out detailed plans for this second stage . Meanwhile, we are acting now to deliver a massive programme to electrify key rail routes – west to Wales and across the Pennines from Liverpool to York. Again, this is something that could have been postponed. But we took the right decision to press ahead. We recently announced a radical programme of rail reform – aimed at tackling fares, subsidy and performance – and, in the summer, we’ll announce the next set of investment plans for rail. But good railways are only part of the answer on transport. We need good roads, too. Again, the problem’s clear: we don’t have enough capacity in places of key demand. There’s nothing green about a traffic jam – and gridlock holds the economy back. So here’s what we should do. Yes, move passengers and heavy goods onto rail. But also widen pinch points, add lanes to motorways by using the hard shoulder to increase capacity and dual overcrowded A-roads. The massive programme announced during last year’s Growth Review made a good start. But how do we do more, when , frankly, there isn’t enough money? We need to look at innovative approaches to the funding of our national roads – to increase investment to reduce congestion. Road tolling is one option – but we are only considering this for new, not existing, capacity. 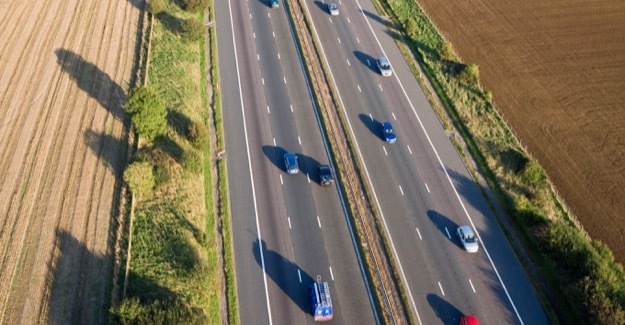 For example, we’re looking at how improvements to the A14 could be part funded through tolling. But we now need to be more ambitious. Why is it that other infrastructure – for example water – is funded by private sector capital through privately owned, independently regulated, utilities but roads in Britain call on the public finances for funding? We need to look urgently at the options for getting large-scale private investment into the national roads network – from sovereign wealth funds, pension funds, and other investors. That’s why I have asked the Department for Transport and the Treasury to carry out a feasibility study of new ownership and financing models for the national roads system and to report progress to me in the Autumn. …it’s about getting more out of the money that motorists already pay. And yes, there’s one other transport challenge we need to be bold about, too. I’m not blind to the need to increase airport capacity, particularly in the south-east. We are acting now to make the best use of existing capacity – Gatwick is emerging as a business airport for London, under a new owner competing with Heathrow. But we need to retain our status as a key global hub for air travel. Not just a feeder route to bigger airports elsewhere, in Frankfurt, Amsterdam or Dubai. Yes, this will be controversial. We will need to take decisions for the long-term – and we will be bringing forward options in our aviation strategy which will include an examination of the pros and cons of a new airport in the Thames estuary. The next area where we are planning bold transformation is energy. We need to find diverse, secure sources of energy that can meet demand, keep prices stable and cut the impact of carbon on the planet. But this is the problem we inherited. We’re powering our country through an out-of-date, inefficient grid and ageing, polluting power stations. We need to replace coal plants, invest in modern gas power and affordable renewable energy. Gas power will continue to be absolutely vital for our electricity system – and we will work with industry to develop a new gas generation strategy that draws in investment and secures electricity supply. Today, nuclear energy forms the backbone of our low-carbon generation fleet but the nine plants still left in service in Britain are reaching the end of their life. I’m convinced that we need to press ahead with their replacement – but that involves three big challenges. One – getting the price right, without state subsidy. Two – getting plants built on time. Three – making sure we maximise the economic benefits to the UK in terms of skills, jobs and manufacturing. So today I can confirm our intention to work with the private sector to deliver the new plants that companies would like to build between now and 2030. And we will continue investing in nuclear decommissioning, and assess whether there is a commercially viable proposition for turning nuclear waste into fuel for the next generation of reactors. Our electricity market reforms will allow the private sector to invest in Britain with confidence. And renewable energy is the final component in a balanced energy mix. Our focus here will be on offshore wind, for hard-headed reasons. It is secure, generated at home rather than imported. And it’s one of the world’s fastest growing energy sources, which means substantial economic opportunities. I believe we are well-placed to become a world leader in offshore wind power – and this Government is doing all it can to make sure that happens. We also can aspire to global leadership in telecommunications, the third area of infrastructure where we will not shy away from big decisions and bold moves. The old economy was built on links through the Royal Mail and then the telephone. Now the world economy depends on digital communication. A route to market for our creative industries that is every bit as essential as the canals which once carried cotton. The problem is that we risk leaving some people behind. While 99% of our population have access to the last decade’s standards of broadband, the market alone will deliver the next generation of broadband to only two-thirds of the country. We risk falling further behind countries like South Korea and Japan. So we are working with the private sector to ensure 90% of properties have access to high-speed broadband by 2015 and that the remaining 10% of hard-to-reach properties can at least access functional broadband of 2 megabits per second. And this week the Chancellor will be announcing ten super-connected cities, which will have universal access to ultra-fast 100Mb broadband, making them some of the fastest and best connected cities in the world. But we also need far better fast mobile data signals. The USA already has 4G capacity in place and our major European competitors are ahead of us in setting up their networks. So we will press ahead urgently with the auction of 4G spectrum so private companies can invest and get the network set up, while including tough new conditions so that it covers 99% of the population. In the meantime this will significantly reducing mobile signal black holes by 2015 – a major boost to economic productivity. …the planning system for infrastructure that should allow better transport, cleaner energy, and modern telecommunications to deliver their potential. The growth of our towns and cities has been held back by a planning system which has encouraged development of the wrong sort in the wrong places. We need homes for people who need them, in the places they want them, while protecting our fine landscapes and preserving the greenbelt. It seems to me that our post-war predecessors had the right idea, embodied in the visionary plan prepared by Patrick Abercrombie in 1944. His plan underpinned the South East’s economic success by proposing well-planned and well-located new towns which would in time become new engines of economic growth. And he twinned that vision with proposals for a new London Green Belt to prevent sprawl. While everyone celebrates the success of the Green Belt, far fewer people celebrate the contribution that the new towns made to maintaining it intact. Some people feel we’ve lost the art of creating great places with the right social and environmental infrastructure. Certainly, mistakes were made in the new towns, with the state deciding arrogantly what people ought to like. But in the last century, private and social enterprise also created places like Hampstead Garden Suburb, Letchworth and Welwyn Garden City – not perfect, but popular – green, planned, secure, with gardens, places to play and characterful houses; not just car-dominated concrete grids. Yes we need more housing, but sprawling over the countryside isn’t the answer. We absolutely must protect our Green Belts and National Parks. But we also urgently need to find places where we are prepared to allow significant new growth to happen. That’s why we will begin consultation later this year on how to apply the principles of garden cities to areas with high potential growth, in places people want to live. And we must get our planning system fit for purpose. It needs to be quick. It needs to be easier to use. And it needs to better support growth, jobs and homes. We’ve given national consent for 16 new energy projects in the last year, enough to produce electricity for eight million homes and we’ve simplified and improved the major infrastructure planning process for future schemes. Already, our Housing Strategy is getting Britain building. The £420 million we committed in November to get sites with planning permission underway has been massively oversubscribed. And I can announce today that the Chancellor will allocate a further £150 million to extend the success of this scheme. But most importantly, shortly we will publish a whole new National Planning Policy Framework – the biggest simplification of our bureaucratic, top-down planning laws in 60 years. It will support sustainable development and it will play a key role in delivering for Britain the infrastructure we need to be successful in the twenty first century. Today, I have set out some of the challenges that face us. The need for faster communications, better housing, secure and stable energy supplies. And I’ve suggested ways in which it might be funded – leveraging the power of the state to unlock private capital. I’m not dogmatic about this. There will be costs and protests. And I am certainly not doing it in the hope of immediate political advantage. I can see the furious objections – the banner headlines – already. But rather than give in we should ask instead: what is it that people want for the future? Reasonable things. A decent home. A clean environment. Jobs for their children, the ability to get around without hassle, huge costs or endless jams. And then we should take the necessary steps to make these things a reality – not leave future generations to deal with the consequences of our cowardice. We can be so much better than that, as a nation, if we choose to be. Great engineering, good infrastructure, a beautiful environment – these things are in our national soul. I began today by talking about the Victorians. Every transforming generation in our history has left a legacy like theirs.